The day I needed comfort noms. But I figured I needed a little summin summin to cheer me up today, so I whipped up a batch of chocolate orange brownies for me and the family to share. Plus, I wanted to perfect my recipe ready for June 4th, when I’ll be doing ‘The Big Garden Party’ in Stone Cross… www.thebiggardenparty.co.uk…. I need to come up with a ‘menu’ of baked goods to sell on the day, and I just can’t decide! Can you guys help me…suggest a few you would want to see there? I’m dead excited about it; I didn’t realise it was going to be quite a large event. I’ve never sold my baked goods on a large scale before, so it will be fun! Anyway, so back to today. I’ve been really bake-deprived over the last few days, so I was super happy to be in the kitchen again, even for a little while. Thank goodness I had this week off so I can fully rest. I had Glenn chatting away to me while I prepared these yummy brownies (yes, I’ll get to the photo in a minute! ), so it was very enjoyable. Brownies were one of the first things I remember baking when I was younger – along with the obvious victoria sponge – so it always make me smile. Though I always hate having to wait for them to set a little…I’ll just eat them squidgy hehe. They are still cooling downstairs. A few drops of orange essence. 1) Melt chocolate and butter together. 2) In separate bowl, mix together all dry ingredients. 3) Add dry mix to the chocolate mix bit by bit until fully combined. Then stir in the eggs, essence and zest. 4) Pour the silky batter into your pre-prepared tray and bake for 25-30 minutes. 5) Don’t bother checking the brownies with a skewer, as the middle needs to be still gooey! Check the top is cripsy but has a bounce to the touch. Remove and cool completely. 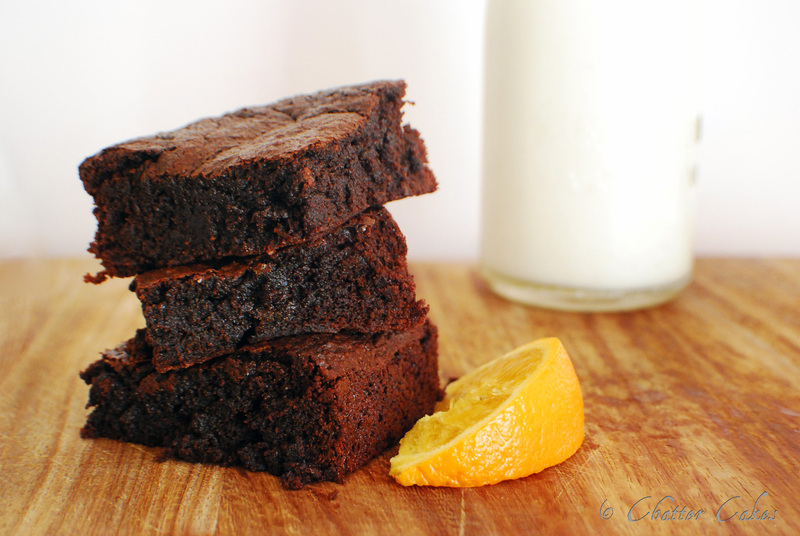 These brownies are actually even better a day after being made.